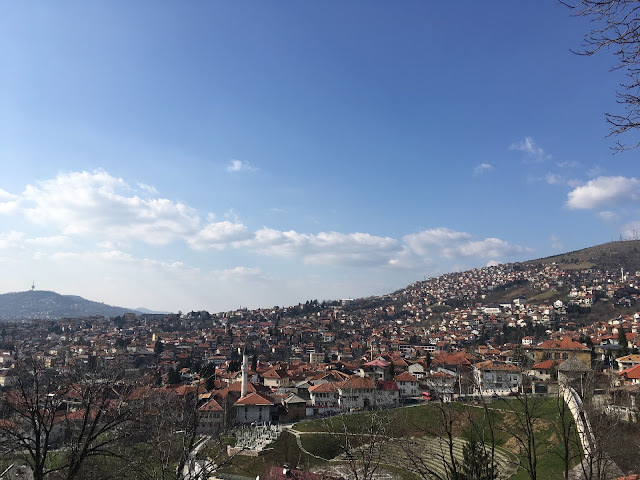 There are a few buses from Belgrade to Sarajevo, but only one bus at 4pm that leaves from the Belgrade city centre that goes to Sarajevo city centre. 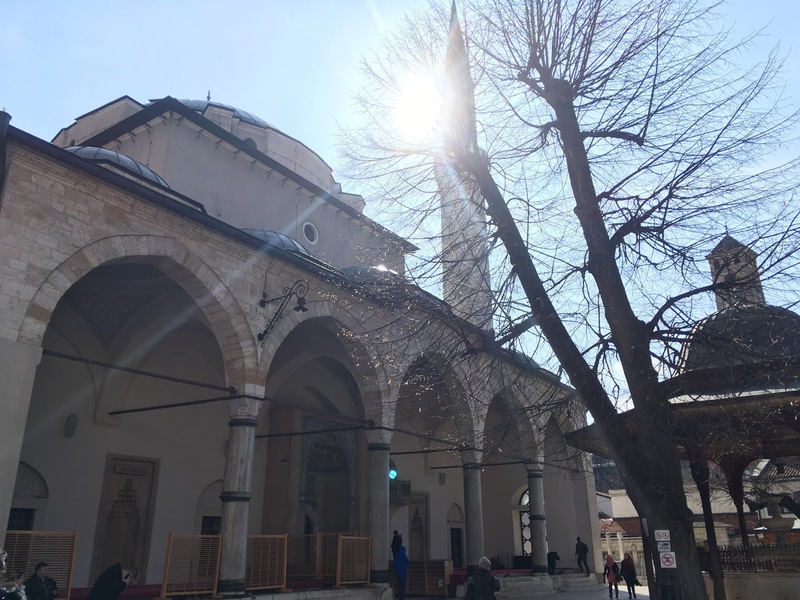 The others may leave from Belgrade centre, but they arrive into the western bus station at Sarajevo (Luzani), which is about 30mins from the city centre on the Trolleybus (no. 103). We took the 1pm bus from Belgrade to Sarajevo West, and arrived at 8:30pm. After a simple dinner, we swung by Zlatna Ribica for a drink. The bar is known for its collection of random bits and pieces scattered about the place. Whoa... smoky too. 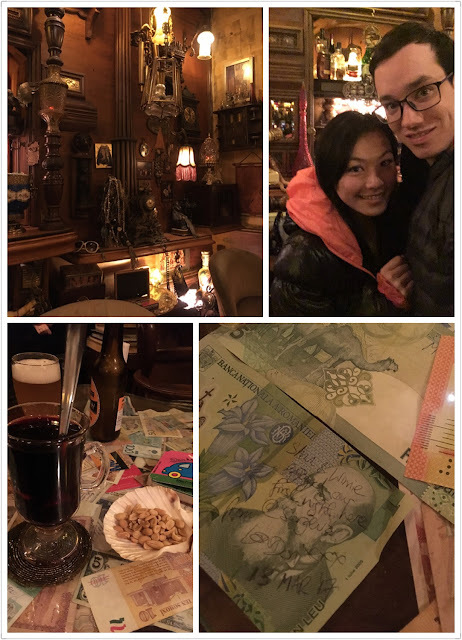 It was a simple bar with no cocktail options, just hot drinks, wine and spirits. I went for a mulled wine and he had a local beer. We started the next day with pancakes from Vatra. Having had some epic, but artery-destructive, ham and cheese burek in Belgrade the day before, we gave the traditional pastry a break. 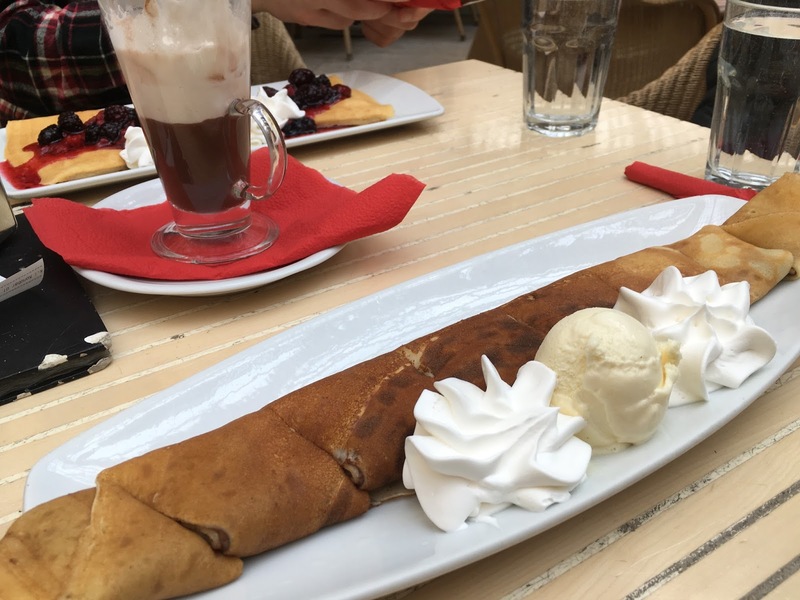 The cafe had a beautiful indoor garden and served very substantial pancakes as well as modern cakes. Then we joined Neno for a walking tour at 10:30am. This was possibly the best walking tour I have ever been on. 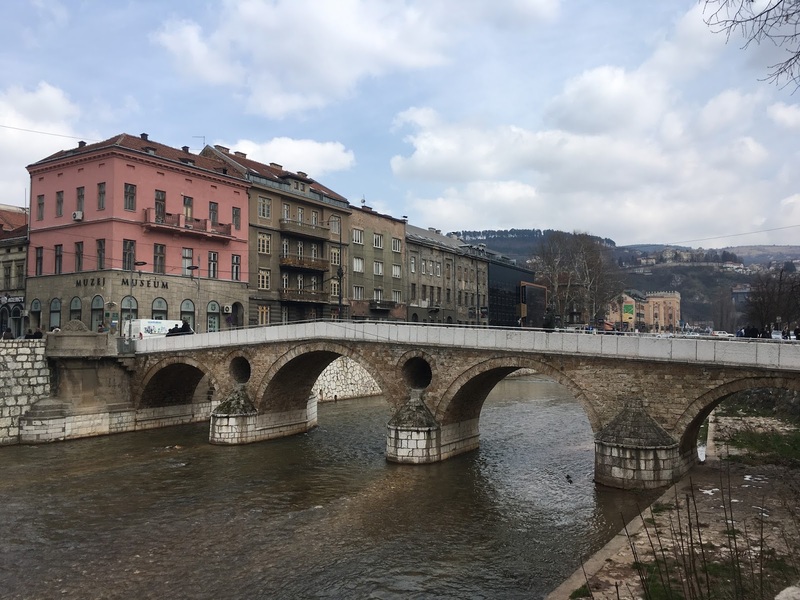 Neno had been through the 44-month long siege of Sarajevo when he was young, so he provided insights to life in the basement and first hand explanation to how they feel about their neighbouring countries. No questions were out of bounds and Neno knew absolutely everything from the history to economy of the country. He took us through the buildings with holes caused by bomb shrapnels, blew my mind with the detail series of events on the assassination of Frankz Ferdinand that triggered the First World War, explained how locals got water from the beer brewery during the war, and how the various rulers influenced the city development. It was most fascinating and informative. We ended the tour in the old town, and Neno gave us tips on local eateries. We tried some Bosnia stew and soup, which was a nice change from the meat-loaded meals we had been having; there's only so much cevapi one could have... and regardless of how the place serves 'the best cevapi', they get a bit sickly. We walked around the old town, which got busier as the sun came out. The Bey mosque was closed for prayers until 3:30pm, so we walked up to the yellow fortress (about 20mins) to take in the view. The mosque wasn't that exciting. Having had a few days of Balkan cuisine, we were craving for something different. We booked dinner at Mala Khuhinja, a restaurant with a no-menu concept that serves food with Asian influence. Reviews suggest it's a 'pricier' restaurant for special occasions, sounded great. It was a slight uphill trek to the modern restaurant. One thing I have taken for granted in the UK is the smoking ban; it was inevitable to be seated next to clouds of cigarette smoke in these countries. Our server spoke excellent English and offered us an aperitif on the house as he explained the no-menu concept. I got a delicious cherry brandy while he had an ultra strong herbal spirit. We also tried some local red wines, which were excellent. Our first course turned out to be pan-fried salmon served on a bed of vegetables with cumin rice. He doesn't usually eat salmon - oops. While this could be very exotic to the locals, it's quite a basic westernised Asian dish from our perspective. But that's ok, I enjoyed it, especially the heap of vegetables. Our second course was beef medallion served in peanut butter infused mushroom and peppercorn sauce, served with crispy potatoes and sesame. I thought this was excellent; the meat was soft and juicy, with a nutty and fragrant creamy sauce. It was a great fusion dish. We were served woodberry cheesecake and hazelnut chocolate mousse cake, on the house, as desserts. Bosnian cakes need a bit more work. Bill came to 68BAM (£35) for two, which is probably pricy by local standards, but we thought it was a bargain! 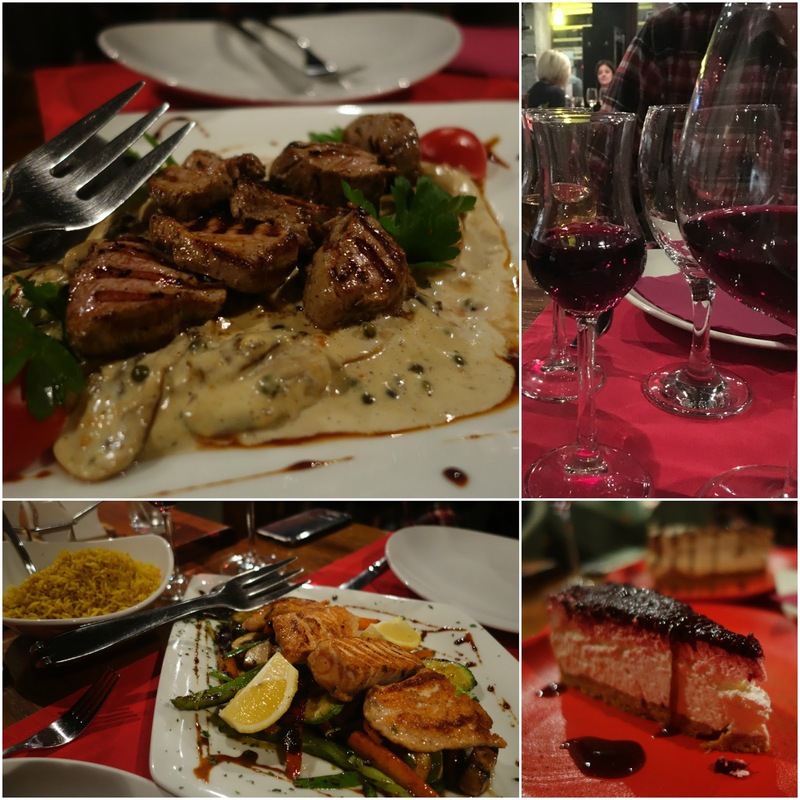 We looked around the restaurant to see if other tables were having the same dishes, there seem to be slight variations with chicken and vegetarian options. Before picking up our rental car, we went to Sac for a burek breakfast. In Bosnia, only the meat ones are called burek, the others are called pies. We had a potato and a spinach one. The potato pie was a bit meh, but the spinach one was piping hot, moist with the right amount of cheese and not loaded with grease. I think it was the best one we had on the trip, even beats the ham & cheese burek in Belgrade. Public transport across the country is not very well developed yet in Bosnia, which made travelling to more remote areas very challenging. After scratching our heads over hitting all the sights with limited bus options, we finally decided on driving. Mind you, it's been years since he last drove, so driving on the wrong side of very mountainous roads with crazy bends and hairpin loops... takes some guts.